Man And Wife Fought Each Other For This Woman! 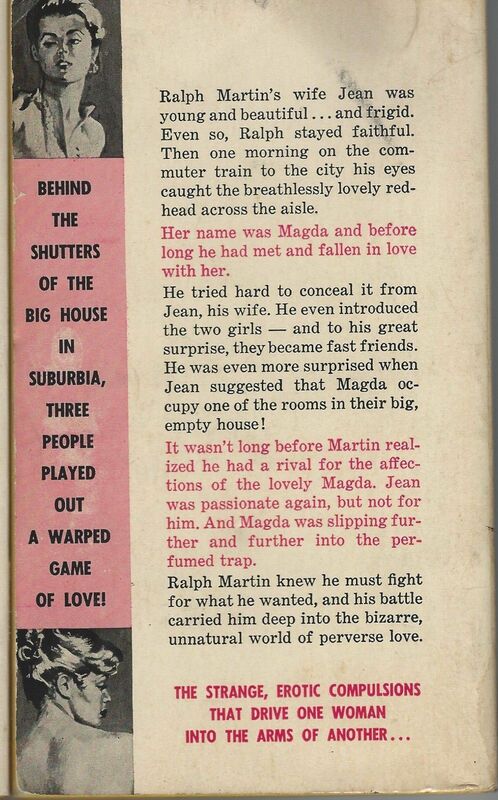 Behind The Shutters Of The Big House In Suburbia, Three People Played Out A Warped Game Of Love! Ralph Martin’s wife Jean was young and beautiful … and frigid. Even so, Ralph stayed faithful. Then one morning on the commuter train to the city his eyes caught the breathlessly lovely red-head across the aisle. Her name was Magda and before long he had met and fallen in love with her. He tried hard to conceal it from Jean, his wife. He even introduced the two girls — and to his great surprise, they became fast friends. He was even more surprised when Jean suggested that Magda occupy one of the rooms in their big, empty house! It wasn’t long before Martin realized he had a rival for the affections of the lovely Magda. Jean was passionate again, but not for him. And Magda was slipping further and further into the perfumed trap. Ralph Martin knew he must fight for what he wanted, and his battle carried him deep into the bizarre, unnatural world of perverse love.